What role is technology playing in the modern fitness and wellness industry? Let’s find out what some of the most trusted experts think. I'm running a small gym on a local district and I'm looking to incorporate app-based technology on the routines my business offers. Is this a good move or a bad one? My members mostly belong to the young and affluent demographic; therefore, I think it'll be such a huge hit. Any advice on this would help a lot. My, times have changed. It's remarkable how exercise was once just a chore, and keeping fit and healthy began and ended with eating your greens. That's until technology came into the mix. Inevitably, tech shook the whole ecosystem and revolutionized the way fitness brands operate, serve and touchbase with its members. I've done work with countless brands who target the active-attractive niche and let me tell you one thing: the health and wellness angle? It's definitely here to stay. So any and all opportunities to innovate is surely the right path to tread. Let's hear it from the big names on fitness regarding techs's play in their industry. People today are seemingly obsessed with quantifying concepts, gamifying them into achievement-based facets built on digital points through advanced monitors, wearable tech and other advanced methods. Fitness First's National Fitness Manager Eric Seegers seems to take note of this clearly. "We live in an infolust world, where everyone wants to be able to measure anything and everything and keep informed with what is the latest and greatest," he shares. "As this rising trend continues to grow, so does the awareness of healthy lifestyles. Working out is no longer seen as a body builder's or a spandex and leotard's world, but is rapidly becoming part of every individual's life," Seegers adds, also mentioning that convenience is a prime driver as well. Johannes Raadsma, Director of Anytime Fitness Philippines, on the other hand, shares technology's role in improving the brand experience. "From our high tech security surveillance system to our unique door access system that gives all our members 24/7 access to 2,800 Anytime Fitness clubs around the world, we believe that we're ahead of the curve when it comes to delivering fitness through technology," said Raadsma. "Preva, the cloud based software from Precor helps members track their goals, activities and achievements in and out of the club, whether on cardio, strength, workout classes and any other activities they may do. This also syncs with other apps that exercisers use. The technology allows us as operators to track what happens in our clubs, promote new activities to our members and better monitor and guide them to their fitness goals." What's interesting with Anytime Fitness is the way they recognized and built on the shift concerned with clients no longer working to the schedule of the gym, but rather the gym is working to the schedule of the client. Raadsma notes that with people being increasingly busy, his brand's community-style facilities make convenient for members to get to a healthier place. As the dynamic industry of fitness develops new trends to attract a diverse niche of health enthusiasts, I've asked our resource persons if technology will prove to be a better support or is it gradually shaping up to be a strong competitor in monitoring and driving fitness goals for the on-the-go individual. Let's see what they have to say. Fitness First's Seegers seems to be all for technology, more so if helps keep individuals motivated and consistent. "The use of technology will always have its place. I personally use a Garmin VivoSmart with the Garmin Connect iOS App. Fitness apps are merely a guide to help you keep active, and if that means it gets a person who was never active their entire life to start standing more than sitting, then I believe it can work," he explains. As for Anytime Fitness, Raadsma believes that although technology plays a big part, there is still a need for human interaction to enact motivation and drive results. "Our clients have diverse needs which require us to offer a dynamic range of programs to suit their needs. Through our group fitness programs and personal training we are able to understand the client and tailor fit a program to help deliver their desired results," said Raadsma. 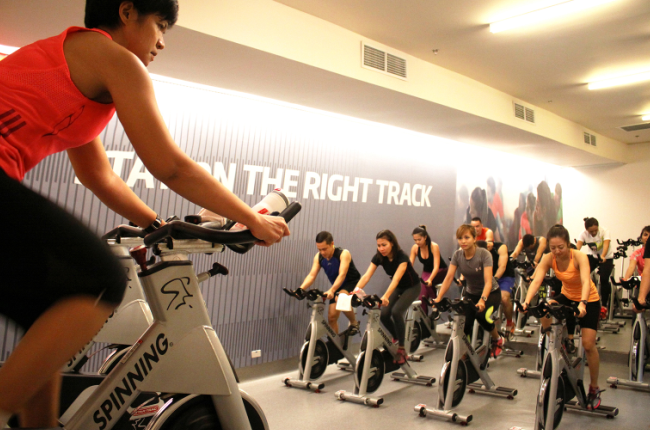 All in all, technology seems a welcome enhancement for upgrading the way fitness brands motivate their members. To which, Seegers shares: "Technology will always have its place in fitness, but at the end of the day, nothing beats old fashioned hard work and sweat. You still have to put in the work, and there is no technology that can help you with that." In looking at technology's future in fitness, Seegers saw a potential to reshape the landscape of an altogether different but still related industry. "I believe that one day, if not already, technology and fitness will work hand in hand to champion preventative health care. This is where we can determine lifestyle related disease like Diabetes, heart disease, before it affects the individual. By getting the younger generation more aware and interested in active lifestyles, we can help battle the obesity crisis the world faces. Fitness will not just be about looking good, but it will be about getting more years out of your life to do things that matter," he shares. The future of fitness that's supercharged with technology is a goldmine of opportunities. It is always in our best interest to explore innovations that help us connect better with our stakeholders. In conclusion, I'm all for you adapting tech to augment and improve the way you do your services. Just listen to what Dinah of Yoga Plus has to say: "In the near future, where all our devices will be smart, and as we move towards the Internet of Everything, new customers will be demanding more connectivity. Whether the companies offering fitness services will be able to take advantage of this trend is another matter altogether. The digital wave is inevitable and if businesses want to survive, they have to ride the wave."